The Greenlining Institute's Mobility Equity Framework offers this tool for analyzing the true impacts of transportation investment decisions. The Greenlining Institute, an Oakland-based nonprofit, released a report today describing a three-step framework that can be used to help communities figure out which transportation investments best serve their needs. The Mobility Equity Framework outlines a three-step process that involves, first, bringing a community together to identify its mobility needs; then conducting an equity analysis to identify the transportation modes that bring the most benefits and minimize burdens; and, last, having the community itself make the final decisions about which modes to invest in, preferably via democratic vote. The report’s authors focus on the creation of a tool to help people work through the second step: thoroughly analyzing the benefits and drawbacks of transportation investments. The focus is not on solving a single problem or even two, but on exploring and comparing all the benefits and drawbacks of potential investments to allow the community to make an informed decision on how to provide for their needs as identified in the first step of the process. She gave the example of “participatory budgeting,” which she said is “not a radical, untested idea.” Participatory budgeting, which aims to create a democratic process for deciding how to spend public money, has been used in New York, Chicago, San Francisco, and Oakland, and the city of Vallejo is conducting the first citywide participatory budgeting process. The key, said Creger, is that a “community should decide what their needs are and THEN figure out the transportation options.” The Mobility Equity Framework, she said, “should be prioritized in low-income areas where community needs have been marginalized for decades.” But the method can be applied in any community. Clean transportation options offer benefits that may not show up in a basic cost-benefit analysis conducted without input from community members. Not only can they reduce health and safety impacts and costs, but they can bring job benefits, reduce income inequality, and greatly increase access to services. But people need to be able to see and understand the advantages and disadvantages of all transportation modes. “This is particularly important in low-income communities of color,” says the report, “because many physical, logistical, financial, technological, and cultural barriers may reduce access to shared mobility” such as that available with bike-share, car-share, and ride-hailing services. The framework provides three overarching equity goals: to increase access to mobility, to reduce air pollution, and to enhance economic opportunity. For each of those goals, the report provides a list of “equity indicators” that can be measured and applied to potential investments. For example, under the first goal of increasing access to mobility, transportation modes can be analyzed according to affordability (How much do households spend on transportation? ); accessibility (Do services connect homes, jobs, and other destinations? Do people need smartphones or credit cards to use them? Can disabled people use them? ); efficiency (How frequent are services, and how long is travel time? ); reliability; and safety (collision risk as well as personal safety from harassment or profiling). It’s important that all three steps of the process be completed for the best outcomes, the report emphasizes. And the outcomes will vary with each community. “While some communities may prefer to compare the equity outcomes of all modes, others may only focus on those most relevant to their needs,” says the report, depending on, for example, residential demographics or the most common trip type. She offered as an example of how the process might work for a discussion of solutions for traveling across the San Francisco Bay. Proposals have been floated for years to study adding another crossing, which some say should be a bridge to allow drivers to get around traffic on the Oakland Bay Bridge. But, said Creger, under the equity framework, the first question would be about the needs of the community most impacted by a new bridge. Using the framework and its tools for analysis, a solution that involves a second BART tube could be found to provide just as many regional benefits in terms of congestion relief without destroying any community in the path of a bridge. The authors see their framework as benefiting low-income communities of color that have been left out of transportation decisions for years, and who bear the brunt of negative impacts from the decision that have been made. While local decision-making processes can adopt the framework, they will need support from state and regional entities like the California Transportation Commission—a decision-making body not exactly known for its democratic approach. Caltrans recently provided a grant to the Metropolitan Transportation Commission, the Bay Area’s transportation decision-making body, to conduct a pilot participatory budgeting process. Applying The Greenlining Institute’s Mobility Equity Framework to suburban areas, as defined by Caltrans’ Smart Mobility Framework, would likely produce a priority list that looks like this. Creger said that a pot of funding about which to make decisions is a first step. “The more funding that can be allocated for these community-involved decision making processes, the more they can build capacity,” she said. Completing the entire three-step process, including the final democratic vote, ensures that the community is the source of funding decisions that affect them. “Participatory budgeting not only increases voter participation, it helps to build trust between communities and local government,” said Creger. “That includes engagement with youth, with immigrants, and with incarcerated people”–the entire community. The Mobility Equity Framework can be found here. It seems like a lot of the mobility rhetoric is focused on reducing the usability of vehicles on current streets or roads. This is a pretty elitist view of how to use our roads and streets. The idea that “I can ride a bicycle so everyone else should too” forgets the fact that much of the vehicle traffic is related to business, or reducing travel time to and from jobs. Getting people and goods to the right place at the right time, allowing people from one economic area to work, shop or be educated in a different economic area seems like a noble cause, and the best way to reduce economic disparity. Using technology to reduce the time / cost of delivery of goods and matereials is also a nobel cause. The best economic output should be part of this conversation. When the transportation solutions suggested are the slowest, and/or most costly, it points out the cost and time are not truely considered in the solutions offered. sustainable, without reverting to moving people and goods at the speed of cave men. This sort of values based prioritization is smart and fair. The problem is that not everyone cares to be smart and fair, it is more gratifying to just react emotionally . 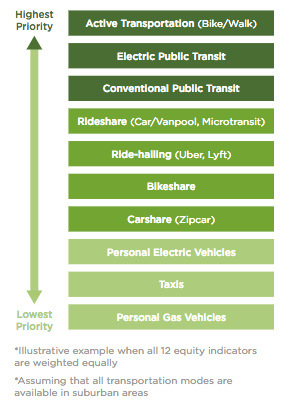 Take a look at how the modes of travel shake out from this prioritization: personal gas vehicles are at the bottom of the list as they should be. Then compare that to the reality of our cities. Clearly there’s an illogical affinity to driving gas powered cars. Part of that is due to the built environment of sprawling suburbs which is difficult to change quickly. When densification is suggested you get NIMBY’s upset that their bucolic environment of personal lawns will be converted into a hellhole resembling the 1970s South Bronx. For an even starker example look at how gun control is handled in the USA. If you look at the pros and cons of allowing 19 year olds to own rapid fire military grade assault weapons it is clear that the value is low and the risk is high. But even people who solidly agree on the base values will vehemently and dogmatically defend the right to everyone to own tools for mass murder. They will even contrive specious arguments to support that emotional response. We need to realize that we do not have a problem with building frameworks to make good decisions, we have a problem with heeding our own advice. I share this concern. I believe the answer lies deeper in the text on p14. It looks like they are assuming a truly shared (thus cheaper) ride-hailing mode. Of course the devil is always in the details and broadly speaking it is not always useful to rank modes like this anyways. A framework that puts Uber and Lyft 4 slots ahead of taxis? So basically if you can bust an industry and recreate it using workers who don’t earn a living wage, that’s a net gain for communities? No thanks.